Nissan has permanently cut Pathfinder prices, which means savings for company car drivers as well as private buyers. To make thisa clearer both to buyers and the taxman, the range has changed. In place of the old S, SE, SVE and T-spec line-up, the Pathfinder now comes in three varieties: Trek, Sport and Aventura. The new, NCAP 4-Star Trek is equivalent to the out-going S except at £22,995 Trekkies get it for £1,550 less. The Trek still comes with all the same equipment, though, such as Nissan’s boldly going ALL-MODE 4x4 system, 17" alloy wheels, dual-zone climate control and CD player. And powered by a 174PS 2.5 dCi motor, it is one of the best value larger 4x4s in the known universe. Except for the Pathfinder Sport, that is. Replacing the SE, the Sport adds seats for seven (the rear five of which fold into the floor), roof rails, rear privacy glass, 6CD in-dash autochanger, remote audio controls, heated door mirrors and a centre console with lid. It also gets as part of Nissan’s current offer of £2,000 worth of very worthwhile DVD Europe-wide Birdview satnav (showing traffic jams), colour rear view camera, premium audio with MP3 compatibility, Bluetooth mobile phone connectivity, voice activation for navigation and phone, cruise control, Intelligent Key system, automatic headlamps and rain-sensing windscreen wipers. Almost forgot the illuminated vanity mirrors which are as good for discrete observation of children seated behind as they are for arranging one’s hair. And at £25,595, it’s all for just £2600 more than the Trek. 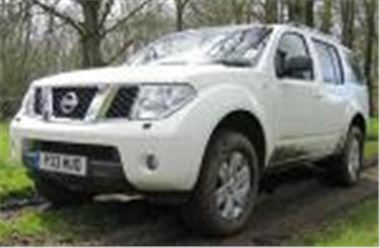 The Pathfinder range, like the Navara and X-TRAIL, is now topped by the Aventura. It’s as well equipped as the previous T-spec but at £28,595 for the economical 2.5 dCi and £30,895 for the fast moving 4.0 V6, the new Aventura is between £2610 and £3110 more affordable. In addition to the Sport’s football season rivalling features list, the Aventura gets yet more to cheer about: wipe-clean leather upholstery, heated and electric front seats, xenon headlamps, an electric glass sunroof, side steps, and separate aircon controls for the rear seats ensuring a cool crew whatever the adventure. And the Pathfinder is capable of loads. It features a robust body-on-frame design with the latest version of Nissan’s acclaimed ALL-MODE electronic four-wheel drive technology, a system that’s as easy to use as it is sophisticated. In normal road conditions, the Pathfinder behaves like a rear-wheel drive estate. However, should conditions worsen, additional drive to the front wheels is automatically engaged. It also incorporates ESP to stop the car getting into a skid and traction control. Coupled with a lower centre of gravity than its rivals, these systems make the Pathfinder a safe and easy car to control. Unlike the Navara, rear suspension is coil-sprung independent for much better ride and handling. But despite its authentic SUV credentials, the Pathfinder is not a huge off-roader. At 4.74m long and 1.86m tall (including roof rails), it’s shorter than a Vauxhall Vectra Estate and little higher than a Chrysler Voyager MPV. Similarly the advanced 2.5-litre common rail diesel that powers the 174PS Pathfinder dCi is one of the more efficient large capacity engines on the market. It generates 238 g/km of CO2 emissions and returns 31.4mpg on the combined cycle. The new Pathfinder range is on sale now.